Replies: 10 (Who? ), Viewed: 9629 times. I recently saw an episode of Grand Designs where a house was built that featured an arched roof built out of clay bricks and it inspired me. I've tried various things with the ol' boolprop trick but can't for the life of me get anything close to what I want. I found a Sims 2 tutorial for something similar but it was more of a outdoor atrium whereas I want a fully enclosed building with an arched roof. Anyone got any ideas on how to achieve this sort of thing? and the rest could be flat or however. What about using individual roof angles? Thanks. Those pictures help me alot. I think I've figured out a way to build the roof, but I'm afraid there won't be any roof to look at from the inside untill EA fixes it (if they will). I threw this together right quick as an example of how it might look with differing roof slope angles. It's not a perfect match as I just put up some walls and slapped on some "paint" rather than copying the architecture exactly. I did try to do something with CFE along the lines of what QBUILDERZ suggested, similar to how you make arched bridges, but I just don't have the patience for an arch of that scale.. especially considering with the different sloped roof it took about 5-10 minutes . Speaking of CFE though, I did actually use it on that example pic .. at the top point of the roof I actually used a 4th floor set of wall and used CFE to lower it, a bit too much I think, but that could be refined. Bah never thought to use the differing roof height trick, that looks like the closet way of achieving what I want. just see if you can decipher anything for now. ill have to come back and add some descriptions. after an hour of monkeying around i came up with something. not quite like feldynn! im missing some of the interior shots! I just watched the same episode of "Grand Designs" a couple hours ago. 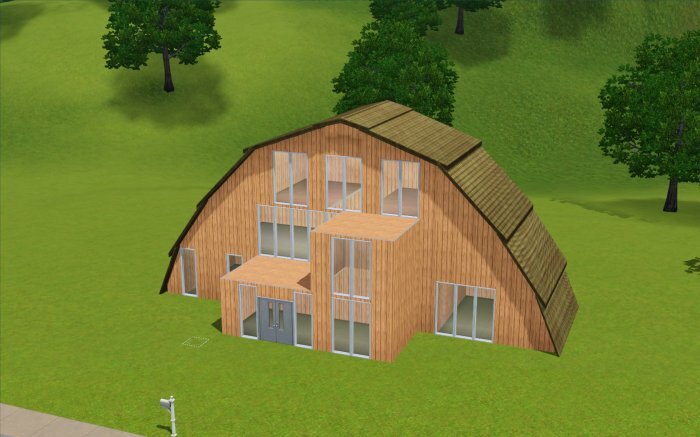 I just did a google search for Sims 3 Arched Roof... and the thumbnail for this item came up first. cracked me up as wanting to build a sims 3 vsn of this house was my goal. So glad You made this, well done. Where can I download this house? Did you notice how old this thread is? It's also important to notice the poster has only 59 posts from registering in 2009. This person is not around. If you want to find a house, post in wcif or "where can I find" subforum to the sims3 discussion forum.